Finder Fundamentals Master Guide | Yenom Marketing Inc. The Finder Fundamentals Master Guide is your essential guide to collecting fat Finder Fees from multiple Finder opportunities. 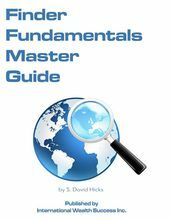 THE FINDER FUNDAMENTALS MASTER GUIDE is IWS’s newest book for Finders. It contains all new material on the art and science of finding things for a fee, and shows how to set up your own profitable Finder business from scratch. WHAT CAN THIS BOOK DO FOR YOU? Finder Fundamentals Master Guide can show you how to make money from Finder Fees! It can be used as a stand-alone resource or as a companion to other IWS publications like the Finders World Kit, Finders International Network Directory, and Global Finding Services Alert Newsletter. THE BOOK IS DIVIDED INTO SIX CHAPTERS. Each covers different aspects of the business of finding and Finder Fees. An Appendix includes sample Finder Fee agreements. THE NEW FINDER FUNDAMENTALS MASTER GUIDE contains approximately 250 pages, in 8.5-in. x 11-in. format. Price: $29.50. Choose PRINT or PDF version.